Téa Leoni and Lynn Stratford. Photo credit: Joy Asico. Last night, Samar and Will Langhorne hosted a fundraiser in their Georgetown home to benefit UNICEF’s education programs for Syrian children. 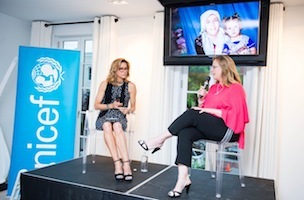 Actress, UNICEF Ambassador, and U.S. Fund for UNICEF National Board Member Téa Leoni was interviewed by Lynn Stratford, SVP of program and community engagement at the U.S. Fund for UNICEF, where she spoke about her recent trip to the Za’atari Camp in Jordan, the world’s second-largest refugee camp. Leoni has been a UNICEF Ambassador since 2001 and a Board member of the U.S. Fund for UNICEF since 2006. In attendance: U.S Fund for UNICEF Mid-Atlantic Region Board members Sarah Al-Shawwaf, John Burns, Max Duckworth, Steve Harris, Elisa Joseph Anders, Sarah Godlewski, Susan Peters, and Megan Salvaggio; Yousef Al-Otaiba, Ambassador of the United Arab Emirates to the United States.